The 2013 Ford F-Series Super Duty’s payload and trailering capability is higher than any model that came before it, but it doesn’t wait for you to get behind the wheel to prove it. From the massive front grille, the large tailgate stamped with “SUPER DUTY” in the back, and the overall enormous dimensions (even the smallest Super Duty can be called large), this is a truck that lets you know right from the start that it means business. 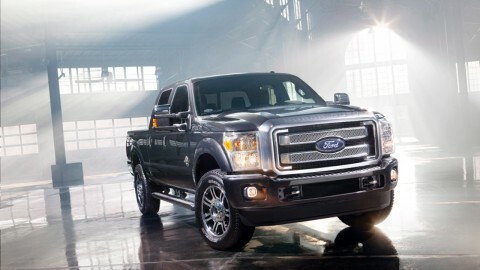 The 2013 Ford F-Series Super Duty is available with two engines. The base engine is a 6.2-liter V8 that makes 385 horsepower and 405 pound-feet of torque. The optional is a 6.7-liter V8 that cranks those numbers up to 400 hp and an absolutely bonkers 800 lb-ft of torque. Both are mated to a six-speed automatic and available with either two-wheel drive or all-wheel drive. Towing capability is 18,500 pounds. The EPA doesn’t give fuel-economy ratings for either engines, but Ford does offer an option package that can make the 2013 Ford F-Series Super Duty capable of running on compressed natural gas (CNG) or liquefied petroleum gas (LPG). The 2013 F-Series Super Duty’s interior features can vary widely depending on trims and options, but quality remains consistent no matter the price tag. There are also plenty of storage and utility options dispersed throughout the cabin, like a lockable bin under an available front center 40/20/40-split bench seat, or another located under the rear seats, complete with a 12-volt power point to charge laptops or cell phones. The 2013 Ford F-Series Super Duty comes standard with antilock disc brakes, stability control, side curtain airbags, trailer sway control, and hill start assist. It received 4 out of 5 stars for Overall Vehicle Safety in government crash tests.